For me, many mornings for breakfast are nothing more than a cup of coffee and a piece of fruit, but occasionally I also love to have a piece of toast along with it. It does not matter to me if it is an English muffin, a bagel, a roll or a piece of any kind of bread, I just really like to have a piece of toast, particularly with an egg, for breakfast. 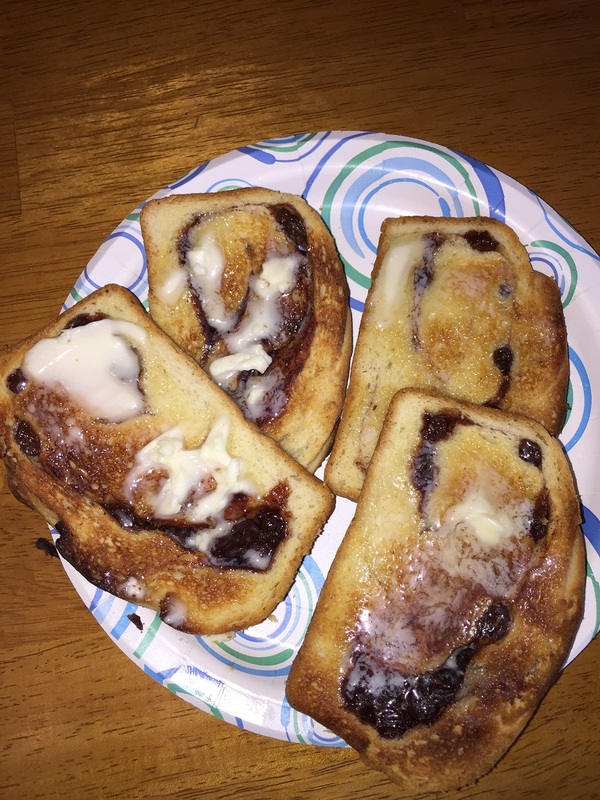 Ever since I was a kid I always really enjoyed cinnamon raisin bread as a piece of toast. That warm bread with the warm, plumped up raisins and the hint of cinnamon across the bread just smells great while it is toasting and tastes even better with a little bit of soft butter on it. 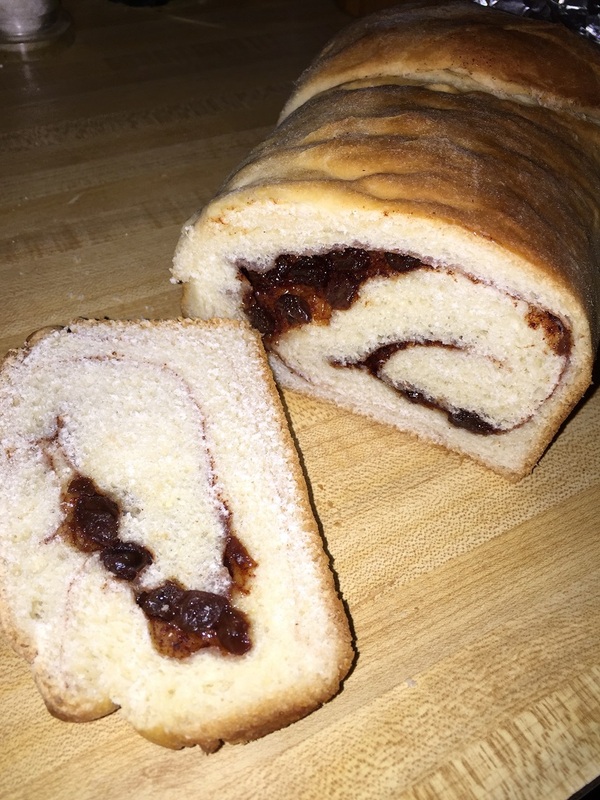 This made me want to try to make my own cinnamon raisin bread so we could have some for Christmas morning this year after we opened presents. I found this recipe from Williams-Sonoma and it seemed to fit everything perfectly, so I gave it a try. In the bowl of a stand mixer fitted with the paddle attachment, combine 1/2 cup of cold water, the milk, 1/4 cup of the sugar, the 4 tablespoons of room temperature butter and the yeast. Add 2 1/2 cups of the bread flour and the salt. With the mixer on medium-low speed, add enough of the remaining to make a soft dough that does not stick to the bowl. Remove the paddle attachment and fit the stand mixer with the dough hook attachment. Knead the dough on medium-low speed, adding more flour if needed, until the dough is smooth but soft, about 6 to 7 minutes. Shape the dough into a ball. Lightly butter a large bowl and add the dough and turn to coat it with the butter. Cover the bowl tightly with plastic wrap. Let the dough rise in a warm spot until it doubles in bulk, about 1 1/4 to 1 1/2 hours. Lightly butter a 9-by-5-inch loaf pan. Punch down the dough and turn it out onto a floured work surface. Dust the top of the dough with flour. Roll out the dough into a 9-inch square. In a small bowl, mix together the cinnamon, the raisins and the remaining 1/4 cup of the sugar. Sprinkle the cinnamon mixture evenly over the dough, leaving a 1/2-inch border around all sides. Roll up the dough into a log and pinch the seam to seal it. Transfer the dough to the loaf pan, seam side, and lightly press the top of the dough to evenly fill the pan. Loosely cover with plastic wrap. Let the dough stand in a warm spot until the dough rises to the top of the pan, about 1 hour. Preheat the oven to 350 degrees. Brush the loaf gently with the melted butter. bake the bread until the top of the loaf is golden brown and the bottom, when the loaf is carefully removed from the pan, sounds hollow when rapped on the bottom with your knuckles, about 35 to 40 minutes. Transfer the loaf to a wire rack and allow it to cool in the pan for 10 minutes. Invert the loaf onto the rack, then invert it again and let it cool for at least 30 minutes before slicing. The bread came out perfectly and let it sit overnight, wrapped, before slicing it on Christmas morning and it sliced perfectly. There was a nice swirl throughout the bread and the bread had great chew and texture with a nice crust. Of course, the true test for me was when it was toasted and it was perfect. I loved the smell of the bread as it was baking in the oven, but it seemed even better in the toaster and made great toast for Christmas morning. I would make this bread any time as it was pretty easy to do and turned out a great loaf. Christmas Dinner Recipes & Ideas : Cooking Channel. You still have time to plan a great Christmas dinner if you have been sidetracked with other holiday chores and haven’t come up with some ideas yet. Cooking Channel has 70 dinner recipes and ideas for you to cover everything that you will need to make a memorable Christmas meal. Check it out! Everyone gets into a bit of frenzy as holidays get nearer and you feel like you have a million things to take care of and plan. I know that is the way it is around here right now as we try to get all of the last-minute things done before the Christmas holiday really sets in. That usually does not leave you with a lot of time to make detailed meals in the days leading up to the holiday as you want to try to keep things as easy as possible. Sure, take-out is always an option when you are looking for something, but an easy alternative is to make some burgers of your own. 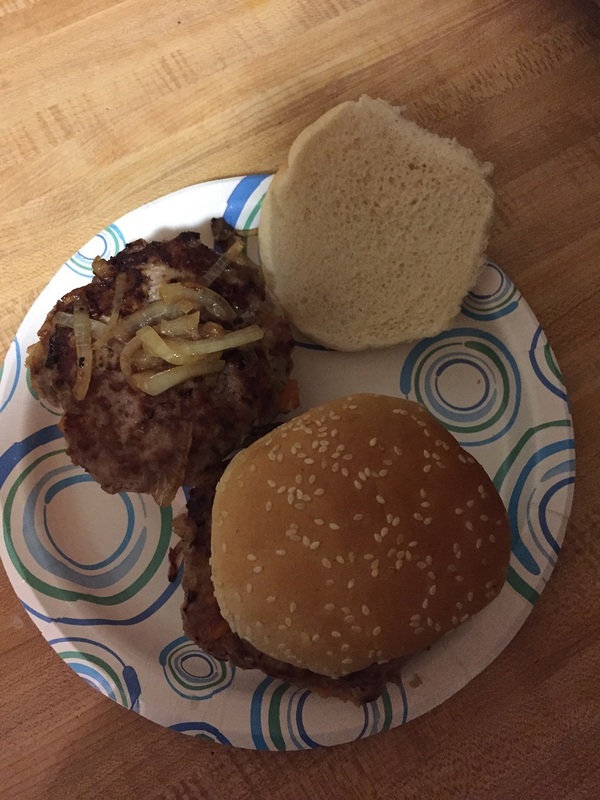 You can have any type you like of course, but since it is the holidays why not try something different and have this holiday turkey burger, which uses ground turkey and turkey sausage together with some other holiday ingredients for a very different type of burger. I got this recipe from Serious Eats and tweaked it a little to make it my own. Using the tines of a fork, poke holes all over the sweet potato. Place the potato on a plate and microwave it on high until a paring knife can be inserted in the middle of the potato without any resistance, about 9 to 12 minutes, checking and flipping the potato every 3 minutes. Alternatively, place the potato in a 425 degree oven and cook until a paring knife can be inserted in the middle of the potato with no resistance, about 1 hour. Split the potato open and allow it to cool slightly, about 5 to 10 minutes. Using a spoon, scoop out the flesh into a small bowl and discard the potato skin. Melt the butter in a skillet set over medium heat. When the foaming subsides, add the onion and celery and cook, stirring occasionally, until the vegetables have softened, about 5 to 7 minutes. Stir in the sage, thyme and garlic and cook until the garlic is fragrant, about 30 seconds. Remove the mixture from the skillet and allow it to cool for 5 to 10 minutes. Place the turkey, sausage, 1/4 cup of the sweet potato flesh and the vegetable mixture in a medium bowl and mix the mixture with your hands until it is well incorporated. Form the mixture into 4 patties and season each patty with salt and pepper to taste. In the now-empty skillet, heat the skillet over medium-high heat and add 1 tablespoon of butter. When the butter has melted and the foaming has subsided, place the burgers in the skillet and cook the burgers until an instant-read thermometer inserted into the center of the burger registers at least 145 degrees, flipping the burger halfway through the cooking process to cook it on both sides, about 4 to 5 minutes per side. Using the rolls (you can lightly toast them if you like), top each bottom half of the bun with a burger and then add the condiments you wish, such as cranberry relish, turkey gravy, spinach and fried onions. You can get the complete flavor of your traditional holiday meal with this burger. The sweet potato adds to the density and taste of the burger and you get a bit of a stuffing flavor thanks to the sage and thyme in the mixture. Add on the gravy, relish, onions and spinach and you have everything to make a holiday meal right on the bun. It is a nice and different alternative to a regular hamburger if you want something a little different for a quick meal. Best Christmas Main Dish Recipes : Cooking Channel. If you are thinking about making something stunning for your Christmas meal, Cooking Channel has put together these fantastic main dish recipes that are sure to draw applause for your magnificent efforts. Check it out!